Turkish Politics in Action: "For Hrant, For Justice"
The twelfth hearing of the Hrant Dink murder case is taking place in Istanbul this week, and the concealing of evidence continues. At the hearing, joint attorneys of the Dink family repeated requests that the security institutions indicated to have played a role in the murder be investigated. These include the National Intelligence Organization, the Istanbul Police Directorate, the Trabzon Police Directorate, the Trabzon Gendarmerie Command and the Intelligence Office Branch of the Police General Directorate. Past government investigations made at the behest of the family have cleared security services of any such role, but evidence that might indicate otherwise remains unavailable to prosecutors, classified as "state secrets" critical to national security. The court rejected requests that statements be taken from Head of Intelligence Department Ramazan Akyurek and Muhettin Zenit. The Dink lawyers also requested that invetigations be made of persons who had concealed evidence, including just how footage from the AK Bank security camera documenting activity on the street where Dink was shot came to be deleted. Also requested was an investigation into a group that legally targeted Dink and might well have incited his murder. Members of this group have tried to disrupt past hearings, as well as harassed Dink's attorneys. Also significant were requests that the Dink investigation be looked into as possibly part of the Cage Plan (part of the Ergenekon investigation), which was allegedly devised by the Naval Forces Command and laid out plans to create disorder by assassinating members of Turkish minority groups. This hearing had many of the same problems as previous hearings, including trouble attaining testimony from a secret witness to the murder. "Secret Witness #1" watched two men shoot Dink, one from in front (Ogun Samast) and one from behind (Yasin Hayal). The same witness saw Yasin's brother, Osman Hayal, at the murder scene. Osman is among twenty defendants, but is not being detained. Most of our cases have already been closed since they reached the statute of limitation. As far as the Dink case is concerned, it is still in the process of being concealed. The crimes have not yet fallen under their statute of limitation. The state has still got the possibility to dissociate itself from the infiltrated and destructive focus in order to reveal the truth. Even with a murder as well concealed as this one, we still have the opportunity not to hand down this contempt of the state to the generations coming behind us, these affiliated crimes constituted after the murder. We are not here based on feelings of hatred, anger and revenge. We are here because of our responsibilities as citizens and because of our never-ending demand for justice. We are part of an ever growing family living in a country where people are getting killed constantly. We do not want the number of our family to increase any further. We hold all state institutions responsible for revealing the organizations behind the murders of our relatives. They will all remain guilty in our eyes until the truth will have been revealed. And they will convey the thought that they can easily commit this kind of crime any time. We came here to make our voices heard to the ones carrying the official capacity, addressing the ones in responsible positions. We are not addressing the people in despair who are sensitive about this issue. We came here to be together with Rakel Dink and our friends Arat, Delal and Sera. We are interveners in this trial as well and today we will follow up that the list of demands submitted by the lawyers will be taken into account by the court. We did not come here to have the pain and sorrow of our families depicted in the press but to pass on our demand for justice. The next hearing is set for May 10. UPDATE I (2/12) -- 19 representatives of the "Deep Families" are meeting with members of parliament to discuss a petition to establish a parliamentary investigate commission to look into their relatives' unsolved murders. Also, a bit of disturbing news: the website of Agos newspaper, of which Dink was editor-in-chief from its found in 1996 to his murder in 2007, was hacked by someone who posted a picture of Samast in praise of Dink's assassination. The hacker also made threats against supporters of the paper. 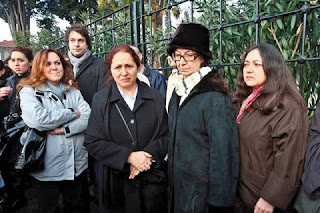 Agos has long been subject to intimidation and illegal harassment, which lawyer for the paper and the Dink family, Fethiye Cetin, claims have and are not receiving the attention by the judiciary and police they deserve. UPDATE II (2/12) -- The Greater Istanbul Municipal Assembly has rejected a proposal to officially change "Ergenekon Street" in Sisli to "Hrant Dink Street." (For history, see Jan. 23 post). The proposal was submitted by Ozgen Nama from the CHP, and had the support of most other (if not all) CHP representatives. However, a majority of the seats in the assembly are controlled by the AKP, and these representatives voted down the proposal. The name of "Ergenekon Street" will stay as it is. Today's Zaman's Orhan Kemal Cengiz has a column condeming the AKP assembly members for their vote. Why did these AKP assembly members, most of whom are undoubtedly supportive of the Ergenekon investigation, vote against the CHP proposal? UPDATE III (2/20) -- Vatan journalist Kemal Goktas is facing five eyars in prison following the publication of an investigative book about Dink's assassination, including allegtions against Akyurek, who initiated the criminal charges against Goktas. At a hearing on Tuesday, Goktas' lawyer,Filiz Aydin, argued the case was not filed properly, exceeding a statute limiting the time frame in which charges may be brought. Goktas will have another hearing on May 11, at which time judges should rule on the merits of Aydin's argument. Goktas is on trial for publishing a classified document revealing information about Hayal passed between the Trabzon Police Directorate and the Istanbul Intelligence Branch Directorate. In another case, Milliyet journalist Nedim Sener is facing at least 20 years in prison for charges stemming from his own investigative book into the murder. Samast, a juvenile at the time he was involved in the Dink assassination, faces a sentence of 18-24 years, though there are indications it might be less. Samast was recently married to a young woman from Trabzon at the F-type prison in Kocaeli where he is awaiting trial. Last summer, Samast threatened members of the Dink family, telling them to "wait five years." See this statement from PEN in regard to Sener. Let me give you a bit of background. Changing names of streets after such murders is not unprecedented. When Abdi Ipekci was killed, "Emlak Caddesi" (where he was shot) became "Abdi Ipekci Caddesi." Hrant Dink was shot on Halaskargazi Caddesi. Look up who this 'halaskar' 'gazi' might be to see why that name change is infeasible. Anyway, I know at least Sevan Nisanyan suggested it in print. There's a side street by Agos and Ergenekon cad. across the street. I'd have gone for the side street [I believe] "Zafer Sokak" as a realistic goal. As for why the AKP people would vote something like this down, I'd say the AKP as presented to the foreigners in English and the AKP on the ground are two different beasts. The question to ask is whether the CHP would have suggested it if they didn't know that AKP representatives would vote it down. I don't know the answer to that, but one hint is that the Sisli district municipality (non-AKP, and the residents vote for DSP/CHP nowadays) has been resisting -- though not outright rejecting -- the placement of a conspicuous plaque or a statue on the sidewalk in front of Agos for several years now.